I love this comic, it so totally captures a big chunk of our problem reaching the world! Haven't we all been jerks at one time or another? How can we keep from being one? It is not occasioned by perfect circumstances, in fact, most of the people I know who have great faith or hope live in very difficult circumstances. Folks who live in ease, conversely, often have very little faith or hope. I look at the Gospels and see people desperate, poor, backs against the wall reaching out to Jesus. Maybe having difficulties in our lives aren't such a bad thing, maybe they point us back to Him in ways we have a hard time doing when we are living a live of ease. What do you think? She does, however, deserve honor. 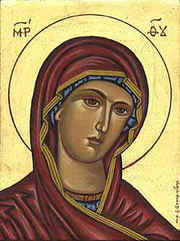 She was especially chosen to be Theotokos or the God-bearer. That is an extraordinary fact. Of course Mary is a creature and isn't the origin of God, Who is without beginning or end. But, in the vessel of her womb, the Second Person of the Triune Godhead chose to truly become man. I think that we have to understand that when He became Incarnate, He did not come and "borrow" a human body to drive it around for awhile like some rental car. No, at the moment of His conception in the womb of Mary, a miracle almost beyond comprehension happened. God the Son united Himself with a human nature forever. Divinity took on Humanity and were so closely bound together in Jesus, Son of Mary, that they could never be separated again. She was real, she was young and she must have been very scared - yet she was willing to be used of God. How many of us faced such fear and real danger, yet willingly laid our lives down? Since I have returned from Convocation, one expensive thing after another has occurred, roof looking like it is totaled from a spring hail storm, tooth filling falling out, daughter's car with mechanical breakdown, and finding out from my sister the 'bill' for my share of my widowed Mother's home taxes and insurance. Not even mentioning 'back to school' costs for my youngest. This year is going to go out with a bang! So Peter got out of the boat, started walking on the water, and came toward Jesus. But when he noticed the strong wind, he became frightened, and beginning to sink, he cried out, "Lord, save me!" Jesus immediately reached out his hand and caught him, saying to him, "You of little faith, why did you doubt?" Indeed, how could I doubt? I love how the imagery here shows Jesus immediately reaching out, not next week, not next year, but in the present. He hears our faintest cry, all will be well. Many of us are fortunate to have in our lives a moment, when we get a glimpse of Who Christ is, and how profoundly He affects our lives and the lives of those around us. Today the Church remembers such a time, when Peter, James, and John, average humans gathered on a high mountain, had such an experience. On that mountain the veil is momentarily drawn aside, and men still on earth are permitted a glimpse of the heavenly reality, the glory of the Eternal Triune God, in shining splendor of Uncreated Light. Interestingly enough, Jesus already WAS the Messiah, it was the perception and understanding of the Apostles that was changed. The Uncreated Light of God is always there. This Light is not part of our creation. It is Uncreated, just like God is Uncreated. It comes from God and it existed before the Universe was created. Moses saw it on Mt. Sinai, and this is the Light that floods the City of God in Rev. 22. This Light of God, the energies emanating from the Triune Being, is always about us, yet humans rarely see it. In the Transfiguration, we along with the disciples present see the glory of the Kingdom of God present in majesty in the Person of Christ. As we noted above, it is not Christ Who is changed, but the Apostles with Him. They see that in Him, all the fullness of God was pleased to dwell. Even so, the Scriptures tell us that the Apostles told no one of what they had seen. It is hard sometimes to translate to others what mountaintop experiences we have had with Christ, but hopefully we over come our reluctance and put into words what the Spirit has shown us. May that Light, Uncreated since before the world began, shine on us also. Lambeth, are we certian about the point? A lot of people are in a turmoil in the Anglican Communion these days. The progressives point out the bald faced power politics played by the right, the conservatives point out the fuzzy thinking and rushed agenda of the left. What is the end of all this? Are hoards of unchurched people pouring into the "Continuing", conservative "Anglican" churches? Hm. Not that I see. Are hoards of people pouring into the Mainline Episcopal Church? Not that I see. But is that a problem? What is the real point here? Is it to save our ancestral worship that we are comfortable in, our vestments, incense, male (presumed straight) Bishops OR is the point to worship Christ and Him crucified? To invite others along side to do the same, and to reach out in His name to all who enter our door or cross our path. It doesn't matter if we follow the "faith once delivered" if our youth refuse to attend. Don't get me wrong, I love my Church, and all the worldwide Communion, and I see so many faithfully following Christ across the world. I do, however get tired of the bickering, and wish we could set it aside.